The SEC’s Division of Enforcement works to protect Main Street investors by bringing cases against those who commit investment fraud. We bring cases involving Ponzi schemes, unregistered offerings, market manipulations, oil and gas scams, fraudulent initial coin offerings (ICOs), and a wide variety of other frauds to help make sure individual investors are protected from those who would steal hard-earned savings, college accounts, and retirement savings. But there’s a lot you can do to protect yourself. The first step is doing a background check to make sure the person selling you an investment is licensed and registered. Use the free tools available on Investor.gov, the SEC’s website dedicated to informing and protecting investors. Investors should also familiarize themselves with How Fraudsters Target Investors, learn about the free resources available to them in the Self-Defense Toolkit, and check out what the SEC’s regional offices are doing In Your Backyard. The Division of Enforcement frequently brings actions against registered broker-dealers and investment advisers for issues such as undisclosed conflicts of interest, excessive or hidden fees, and inadequate training or supervision of brokers and advisers. 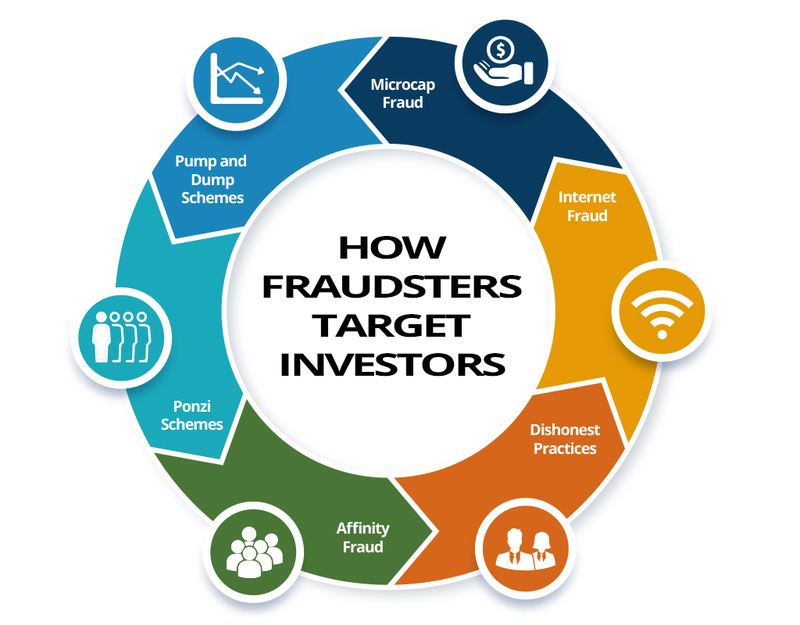 In many Ponzi schemes, the fraudsters focus on attracting new money to make promised payments to earlier-stage investors to create the false appearance that investors are profiting from a legitimate business. Microcap stocks, the thinly-traded stocks of small companies, are frequently at the center of scams targeting retail investors. The owners and promoters of these companies often lure individuals into investing in these companies with promises of huge gains. Instead, the investors lose significant sums when the insiders take the money for themselves. One common type of microcap fraud is a pump and dump scheme, where fraudsters typically spread false or misleading information to create a buying frenzy that will “pump” up the price of a stock and then “dump” shares of the stock by selling their own shares at the inflated price. Once the fraudsters dump their shares and stop hyping the stock, the stock price typically falls and investors lose money. A website, online message, or social media site can reach large numbers with minimum effort. It's easy for fraudsters to make their messages look real and credible and sometimes hard for investors to tell the difference between fact and fiction. Affinity frauds target members of identifiable groups, such as the elderly, or religious or ethnic communities. The fraudsters involved in affinity scams often are – or pretend to be – members of the group. Search the SEC’s Investment Adviser Public Disclosure (IAPD) website for information about an investment adviser firm’s business operations or an individual investment adviser’s professional background and conduct. IAPD also offers links and information about brokerage firms and their registered representatives derived from FINRA's BrokerCheck system. Learn more here. The EDGAR database provides free public access to corporate information, allowing you to research whether a public company’s securities are registered with the SEC. You also can research information provided by mutual funds (including money market funds), exchange-traded funds (ETFs), and variable annuities. Learn how to use it here. Learn about some of the common tactics that fraudsters use to trick unsuspecting investors and how to avoid them here. Many investors use the internet and social media to help make investment decisions. While these online tools can provide many benefits for investors, these same tools can make users attractive targets for criminals. Learn more here. If you spot something that looks like a potential fraud, let the SEC know by clicking here. With 11 regional offices, the SEC is committed to protecting investors in every corner of the country. The SEC’s San Francisco Regional Office hosted an event for teachers in California.